An anti-soppy, hilarious, cancer-wrestling memoir on life and its side-effects. Can there be anything wonderful about being struck by cancer, twice? With a survival kit consisting of only humour and courage, Neelam Kumar brilliantly captures her struggle through the disease and shows how to kick adversity and come out smiling. Kumar recounts years of illness, betrayal, financial hardships, relationship breakdowns and the death of loved ones besides the obvious emotional and physical trauma that she battles with. A story both entertaining and profound, To Cancer, With Love, increases our understanding of the disease and will leave you marvelling at the resilience of the human spirit. This book is an earnest attempt to help you triumph over anything life throws at you. An exclusive and unique interactive section will guide you through your personal challenges in a step-by-step and rational manner. Initially, the character Carol, appeared to me as a sort of hallucination of Neelam’s neurons, like the one Izzie used to have of Denny’s presence in Grey’s Anatomy TV Series. It was so more than just a hallucination. Carol is a wonderful idea. Brilliant. To have a part of you always telling the truth out loud, can be a fruitful deal. I’m gonna try this in my life, soon. The first part of the book, ‘Carol and Me’, deals with the Protagonist, Neelam, talking to her inner soul. The second part, ‘The Sea and Me’, has all the life lessons, the author has learnt from the sea and all the things she likes about the sea. From inception, until the end, the book has a gripping power. The author’s commendable hold over the language supports the amazing plot of the book. The book is humorous. Author’s pen has shown her true colours of wit and sarcasm in the one-liners. In the second part of the book, readers come to know, via Neelam’s poetic proses, why she loves the sea so much. This book is motivational. Inspirational. Brave. Witty. Charming. And, magical! Ever felt the moment, when smiling, you’re getting the inspiration simultaneously? That’s this book. This is an entertaining, life-changing book. And, I recommend this to everyone out there, to have a taste of life, as to how to live fully! Thanks to the author and the publishers, for providing the readers, such a beautiful art! 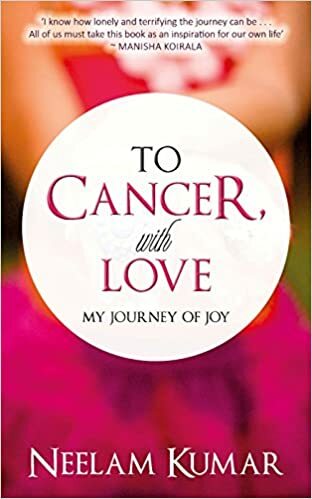 Another book you might like is Geetha Paniker’s When I Fell in Love with Life, where the author has shared her brave journey with cancer fight. The title is appropriate, while the book cover could have been better. Of course, this is my personal opinion. 4. Myra– a book in 4 genres. 5. To Cancer, With Love-My Journey of Joy. This has emerged as India’s first humorous book on Cancer. Neelam has worked in India’s largest steel company as Chief of Communications (Public Relations ) and Dy. General Manager (Corporate Affairs) for three decades. She is the MD of “9 to 5 Corporate Lounge—The Training Hub” (www.thetraininghub.co) (currently under construction) through which she conducts very popular training programs on Communication, Life Skills, Spoken and Written skills for Corporates, Schools and Institutes. She is currently working as Life Skills Coach at Podar school, firing the minds of youngsters to build a better society by transforming themselves. Neelam holds a Masters degree in Journalism from the U.S. She also has a Bachelor’s degree in English Literature, a Bachelor’s in Education and a Post Graduation in Public Relations and Advertising.